Around 2,700 migrants from 13 boats were rescued some 35 miles off the coast of Libya yesterday, according to the Italian Coast guard. 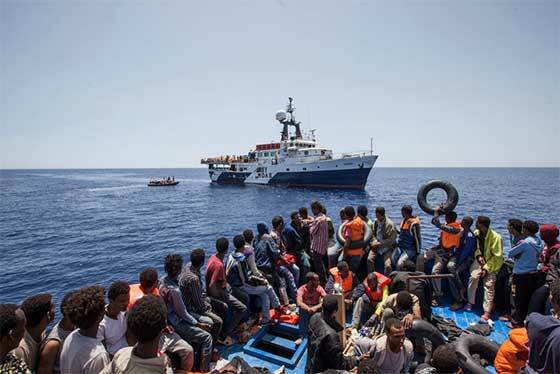 The migrants were rescued by a German navy ship and a rescue ship operated by Mediterranean Offshore Aid Station (MOAS) and Medecins Sans Frontieres. Throughout last weekend, approximately 4,800 migrants were rescued in the Mediterranean and brought to Italian and Greek ports. The Italian Coast Guard saved 3,720 migrants in the Channel of Sicily, while Hellenic maritime forces brought to safety another approximately 1,100 migrants. A total of 611 migrants rescued since Sunday night are due to arrive in the port of Taranto on the Swedish coast guard ship Poseidon. It is not known at this time if they were rescued from a single craft or from several. Another 200 rescued migrants arrived Monday night in Lampedusa. Officials in Tunisia have reported that a shipwreck occurred in Tunisian waters on Friday, July 10: the Tunisian Coast Guard rescued 49 migrants and recovered the bodies of at least five others. Another 20 bodies are still to be recovered. This shipwreck was the latest in a deadly series this year and occurred on the heels of two other incidents last week: one in the Aegean Sea, during which at least 19 migrants drowned, and one in the Channel of Sicily, where a total of 12 migrants - 8 men and 4 women - perished. According to IOM estimates, over 1,900 migrants have drowned so far this year in their attempts to reach Europe by sea, of those more than 1,840 perished trying to reach Italy.